Free printable Five Little Ducks printable coloring page plus more nursery rhyme inspired activities for children. 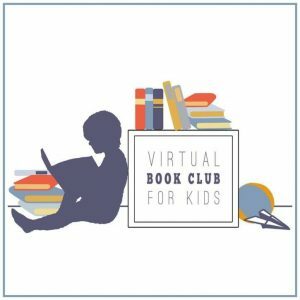 This week’s Virtual Book Club for Kids theme is Nursery Rhymes. I’m highlighting an old post of ours featuring Five Little Ducks. Over in the Meadow is another nursery rhyme we love. This week I made a rare venture into semi-structured crafting with my kids, creating this simple printable free coloring page (see download link at the end of this post) to go along with Five Little Ducks. We read the book yesterday, and this morning I gave each kid the page, with no other instructions. It was fun to see what they did with it! Four-year-old Johnny’s ducks have fantastic eyes (I had considered adding a single eye on each duck as part of the printable, and seeing this made me so glad that I hadn’t!) I’m particularly fond of the Picasso-esque duckling leading the group. Notice that he has the mama following the ducklings, instead of the other way around! Two-year-old Lily’s duckling décor appears to be inspired by our child-decorated castle – which she was, incidentally, working on this past weekend. Her ducks have eyes, too, although they are a bit hard to spot. I can find them most easily on the mama duck, as well as the two lead babies. I thought it was interesting that she clustered her babies around the mama, instead of lining them up like her older siblings. We laminated our ducks, and the kids played with them for weeks (I recommend this laminator and Amazon Basics laminating pouches). Cut these ducks out of felt to use on a felt or flannel board. Cut out two of each duck and let your child sew them together – either with stuffing in the middle, or random stitching the way we did these flowers and trees. Add a craft stick to the back of each duck and use them as puppets. Try these fun nursery rhyme activities with your kids! Sew Humpty Dumpty – free pattern! What is your favorite nursery rhyme activity for kids? 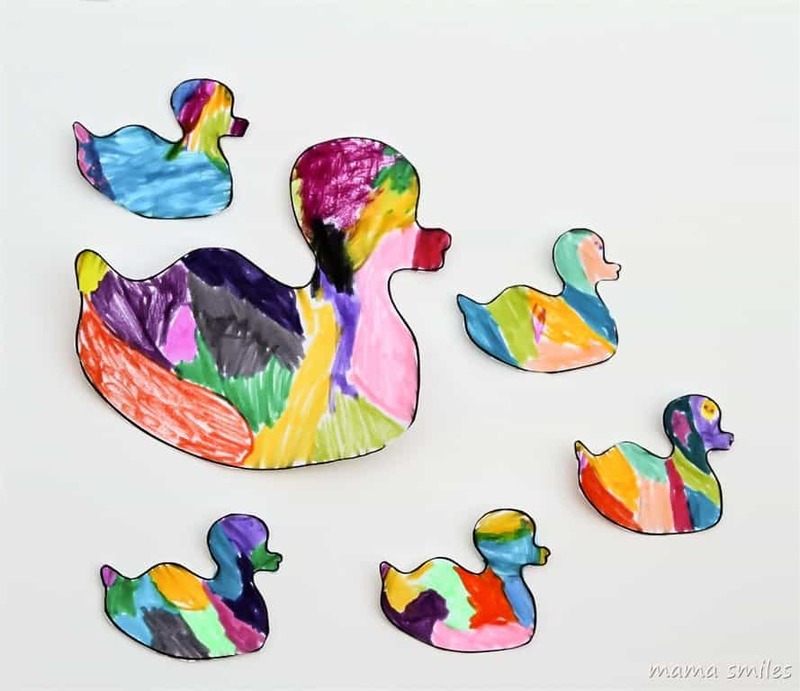 Have you tried out our five little ducks printable? Please share in the comments below, or on my Facebook page. You can also tag me on Instagram. These are super adorable!! 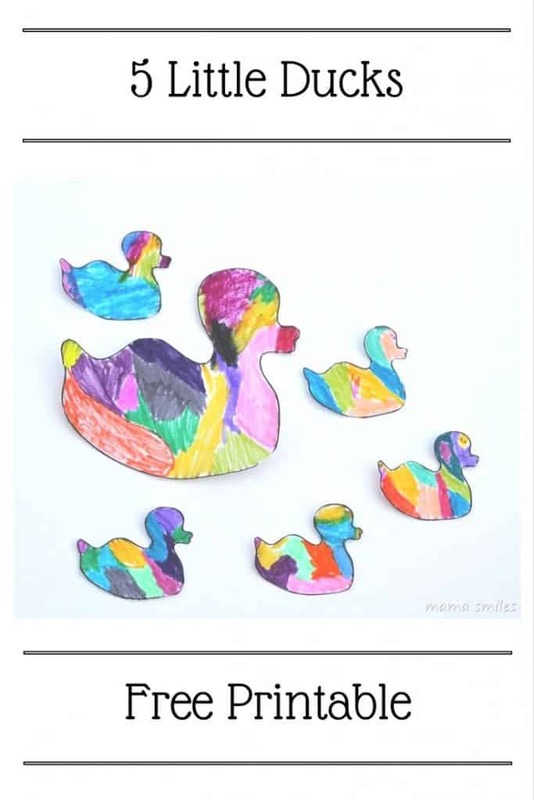 It’s neat to see how kids each interpreted and colored their ducks :) Thanks for including the printable. Thanks! It was fun to see how much my kids enjoyed this – and how they each put their own spin on it! They’re super cute. Do you know if the Nook app is out yet? Looks like it isn’t yet, unfortunately. Hopefully by the end of the week! How awesome! I am amazed by the differences between ducks. Johnny is getting to be quite an artist too – his eyes are very realistic! I was surprised (in a good way!) at how differently they each approached the project! Thanks for the printable. It is so interesting to see all of your kids’ different personalities come out. I love your idea! These are each spectacular in their own way. I’m especially impressed with the eyes Johnny added and Lily’s vibrant yet not overlapping colours. Are you going to keep them on display in your house? That is so cool to see how they did the craft. I am like Emma and would so have yellow ducks! I can’t believe how cool Johnny made the eyes! That is really near. And Lily went all out with her ducks, too cute! He coloring is very nice, especially for how young she is! So many ways to use this printable – not really structured at all! Really a great idea and printable – thanks! Love how they colored and arranged their ducks! So different yet they all look fantastic! These are so cute :) I love the differences between their ducks and the eyes on Lily’s duck are so similar to how J is drawing his eyes at the moment as well. I loved that post from NurtureStore! And your Mo Willems activities for “The Duckling Gets a Cookie” are fantastic! That is a great printable! I love that too – took me by surprise! It’s nice to see how children who have been given freedom of expression, express themselves in very different ways! 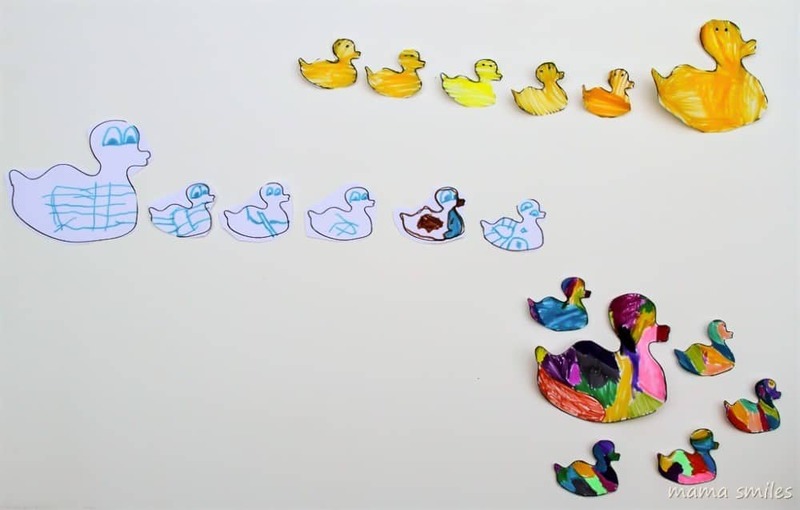 You might also like 10 Little Rubber Ducks by Eric Carle. It is one of the books I am taking to Cambodia to train the teachers in Svay Pak. It fits in perfect with your 5 Little Ducks. I’ll check out your post – love Eric Carle! what a fun activity. i find it so interesting the variance in their arrangements… i suppose there’s a way to decipher meaning in them, huh? thanks for linking up to tip-toe thru tuesday! These are really cute. I found them via pinterest and I printed them out last week and took it a step further and made them into stick puppets to go along with a song. Wrote about it in my blog here. Thank you! I love how your idea was still open-ended enough to allow for creativity! These are way too cute! I love how each child showed his/her own personality in the coloring. What a great addition to the reading. Thanks for sharing with The Sunday Showcase! I love this activity, the ducks are so sweet! Love how they are all so different! Glad you shared with us at tip toe thru tuesday! Oh, I love the free printable! Thank you! Ducks are really hard to draw ( to me anyway lol) Thanks for sharing with Tuesday Tots last week! These are super cute – we always end up with two eyes on one side too! I’m featuring this post on this week’s Sunday Showcase – hope you stop by to link up again! LOVE how differently each of them made their ducks! That is the best part! Crafts can be individualized and open ended and that is what you have done here! Bravo! I love Lily’s version of the ducks. I love how she made them so colorful (and yes, I noticed the cute little eyes too). Haha. It’s really adorable when our kids become imaginative and become artists on their own cute ways. I love the print-out. Thanks. Did the children cut the ducks out themselves or did you cut them? I teack Pre-K and the children are doing pretty well with cutting, however, most of the things we cut are large in size. The duck are small and there are a few students that may have some difficulty. Can’t wait to use this with the children. My 4yo cut out his, but if you look at them (middle photo with the blue lines) he didn’t cut on the lines, but around. My 6yo was able to cut them out without any trouble, and I cut out the multicolored ones that my 2yo colored. 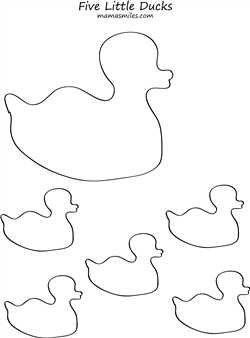 The design of the ducks makes them a bit tricky to cut out if you are following the lines. I love how many different ways there are to use these cute ducks. Thanks for sharing the printables. These ducks are so adorable and I love everything inspired by nursery rhymes.